Sea Cliffs (and kayaking?) 20th and 21st June 2009. The Main Cliff at Gogarth is one hell-of-a place. From a distance it looks green and horrible. The scramble down looks intimidating. And the sea level traverse is - well, an unknown quantity. 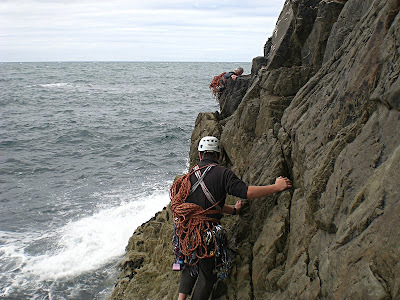 The icing on the cake - in typical Gogarth style - is that the easiest routes are probably still too hard for us. In reality... The scramble down to sea level turns out not to be too bad, although it is very exposed and there's a little too much steep grass for comfort. The sea level traverse is plain good fun, partly because we got very wet when a couple of big sets came in and submerged our feet and ankles. Our legs were also very damp from spray. The route, Scavenger (HVS 5a, 88m, 3*), is just fantastic. It was really hard work, though - certainly no DOWH (how they can be neighbours in the graded list is a bit of a mystery). Pitch one is a pleasant wall climb on jugs and satisfying feeling pinches, and leads to a suitably large ledge. 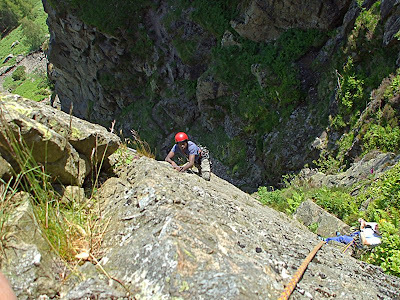 The second pitch is a full on 45m, tackling two corners either side of a short traverse. The first corner has some very hard bridging moves. I was leading, and found it sufficiently difficult and strenuous enough to fall off couple of times. This was particularly frightening considering the limited gear and it's apparently poor quality. What I thought was a very dubious wire wedged itself in(and is in fact still there), which I was grateful for because if it hadn't the sound of pain would have been ringing around Gogarth Bay. I did eventually manage to overcome this section with more tentative moves even further above the still iffy looking wire using some unnervingly wobbly holds. The second corner is technically a fraction easier, but it is very sustained and fantastically exposed - it's a 30m vertical drop down to the sea from the bottom of it. Ste led this in typical determined fashion after I took an impromptu belay due to my fragile mental and physical state. When I arrived at the belay there was an overpowering stench of rotten fish - which Ste claimed wasn't him but a nearby razorbill nest. Above this a 50m pitch - the first quarter of which was rock covered in weird green furry things, the rest steep, crumbly grass - led with much relief to the top. 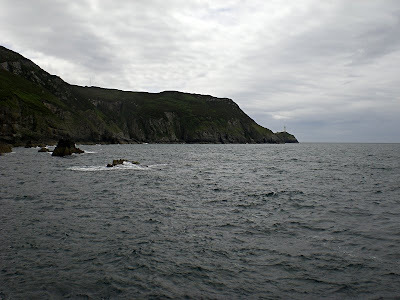 All in all, we got a full value Gogarth experience - we wouldn't have it any other way. Quality. 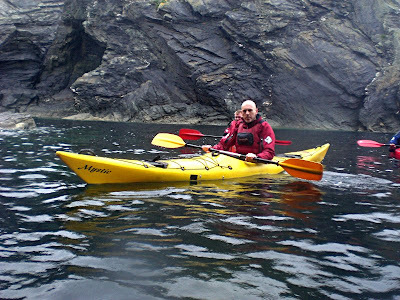 We also went kayaking there (Between South Stack and Treaddur Bay - pen-something-something point?) with Jeff and the Wigan Canoe Group on Sunday - good fun and even more hard work! Joint Merseyside Clubs Meet 12-14th June 2009.... past event. The meet began on the Friday evening with George Chambers(Wayfarer) cooking his usual large, stupendous dinner for all that requested it. Saturday dawned bright but soon the rain clouds arrived and everyone was in a quandary whether to go climbing or walking. Many Merseysiders were undaunted and braved the occasional shower on Raven Crag. 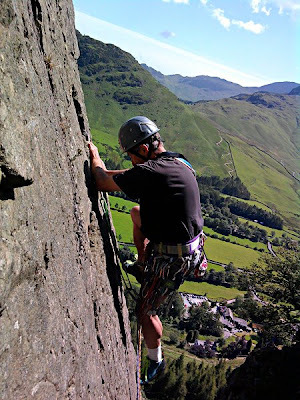 Martin Tomlinson, Dave Ormerod and Richard Porada intended simply to summit Bowfell but somehow Richard got roped in with a climbing pair (claiming to be ex-Wayfarers) on a very greasy Bowfell Buttress. Ever ready climbers Ed Wray and Bonnie Vandesteeg visited Pavey Ark, whilst Paul Davies schooled Pam Davies on alpine techniques on Upper scout Crag as she will be joining an alpine Wayfarers' team later this summer. Although Pam has climbed Cho Oyu (6th highest peak in the world), Mera Peak, Island peak and has been to the north col of Everest, her climbing development has amazingly missed alpine climbing. Most other Wayfarers noted the early morning showers and took a walk to Grasmere by various high or low routes. Peter Spalton went bike riding in between tidying the Hut (bemusing many people left wondering where their food had gone). The Saturday evening meal was a more local affair than usual. The Aberdeen Angus Topside was bought from the local farm(Milbeck) near the New Dungeon Ghyll pub. It is worth noting that Angus beef and Herdwick lamb (cut as you decide) is easy to order simply by phoning Sue Taylforth at Millbeck Farm(01539 437364) a couple of days before you want it – it is butchered in Newby Bridge hence the notice required. Alternatively, you could order over the internet via the Millbeck Farm website. The four vegetarians had a cheese bake but all of them praised it even though it was prepared by a non-vegetarian cook. On the Sunday the Merseyside crowd, Paul Davies, Jennie Gorman, Lee and Shirley Bonner, Hugh Mantle and Marcel Becker were joined by St. Helens M.C. 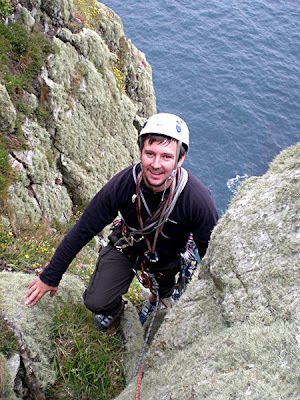 man Malcolm Brentford doing various climbs on White Ghyll. Meet leader Ken Fyles, Allan Mtsendero, Heather Scarrott, Les Berry and Carol Baxendale representing the St.Helens M.C. busied themselves on Raven Crag in blustery conditions. The 28 people on the meet were predominantly Wayfarers with eight Merseysiders, four St.Helens MC and one Vagabond. Catering was the turn of St.Helens MC with Ken Fyles as principle cook ably assisted by Carol Baxendale and Les Berry. Other attendees of the meet were Graham Penny, Stephen Auty, Colin Smith, Jack Middleton, George Bintley, and Wayfarers' President Peter Dixon.